The doctors cleared me for travel to Worldcon. Flight cancelled. Hotel cancelled. Membership up for sale. 3. Where I live. Interestingly, most badges I saw didn’t have a state listed, but some did. 4. My 2009 Hugo Nominee pin. 5. Green ribbon for being a Program Participant. and #7 was handed to me by George R. R. Martin at the post-Hugo party… my official HUGO LOSER ribbon. Having a great time at Worldcon. Attended the WSFS Business Meeting and know what to expect for tomorrow’s vote on the future of the Best Semiprozine Hugo. Attended a panel about magazines and whether or not they should have a Hugo, which led to several interesting discussions during and after the panel. Off to the Chesley Awards in a few minutes to represent Mats Minnhagen should his Clarkesworld Magazine cover win in the Best Magazine Cover category… and then immediately to my next panel on Mainstreaming the Geek Dream. Parties to follow. If you are at Worldcon and have an opinion on this matter, please be there. Description: If you’ve just discovered the SF field, or you are a long time reader who knows you’ve missed a lot out: what are the books you should read to get an idea of its range? Especially if they’re older works, you may not stumble across them easily…but they can be just as good as something published last week. Will be accepting on behalf of Mats Minnhagen should his Clarkesworld cover art win in the Best Magazine Cover category. Reception to follow. The vote on whether or not the Best Semiprozine Hugo should continue will be held here. If you have an opinion on the issue, please attend. The online publication is alive and well and thriving. Editors and writers talk about electronic markets. Clarkesworld is up for Best Semiprozine. I’ve been very low profile for the last couple of weeks. Email piled up a little (if I still owe you a response, sorry, soon) while I worked on tieing up some loose ends at the day job. I’m not giving them any excuses to prevent me from going to Worldcon next week. Back in April, I launched savesemiprozine.org in response to a movement to eliminate the Best Semiprozine Hugo Award. I’ve had the pleasure of working with a great group of editors and publishers over the last few months and couldn’t be more impressed by the things they do and what we, as semiprozine editors, represent. I have become even more convinced that this category should not be eliminated. To close things out, I’ve started a four part editorial on savesemiprozine.org that addresses various statements made against keeping the award. My plan is to post the final entry on Friday and encourage discussion throughout. Whether or not you’ll be voting, I hope you’ll take the time to consider what is happening and be a part of the discussion. 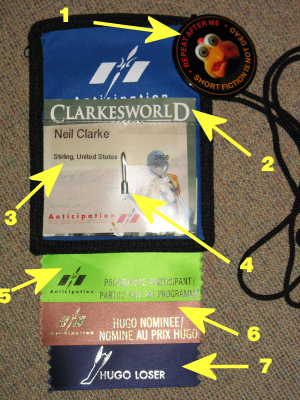 The final vote that determines the fate of the Best Semiprozine Hugo will be held at Worldcon.